Everyone wants to give their pet the best possible life. At MaxWell Pet, we strive to do just that with our revolutionary natural formulas. healthy lives without harsh prescription drugs and their harmful side effects. That passion also extends to animals - Dr. Garber is a self-professed pet lover, and when he started treating animals like his dog Sophie with his formulas, he saw amazing results. Pets and humans alike experience tough, sometimes painful health problems, and the MaxWell Pet team believes that prescription treatments can exacerbate things. Veterinary medicines can often have the same side effects as those for humans - lethargy, incontinence, susceptibility to other ailments and more. Instead of fixing one problem with another, we created natural remedies with zero side effects to solve health issues and improve the lives of your pets. We invite you to become part of the movement to help pets live longer and healthier lives. Let’s make a better dog world together. Barbara Anne D. from Morongo Valley, CA says: "Calm & Happy is a wonderful formula! Pet-friendly, easy to administer, and VERY effective! My pet, a rescue, was experiencing great agitation and stress. Since his past is unknown, it can be difficult or impossible to determine the cause; or isolate what is upsetting him. He stresses--then I stress. I put some Calm & Happy in his water. He liked it! And in a few minutes, he settled down and was restored to his sweet, gentle self. 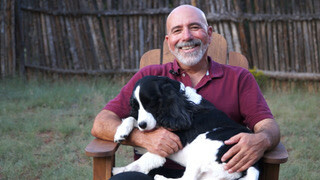 Thank you, Dr. Garber, for an excellent natural solution for my beloved--but easily stressed--animal friend." Chloe D. from Santa Fe, NM says: "Thai is a 6-year-old American Pit Bull Terrier who had a rough start in life. Though he now lives a comfortable life, and has been able to work though many of his challenges, he still suffers from chronic skin infections due to his compromised immune system. For years this has left him itchy and uncomfortable. He even had to give up his spot on the foot of the bed as he would keep me up at all hours of the night. Since starting this remedy his itching has almost entirely diapered, his skin no longer appears red and irritated, and he smells MUCH better. Because of this remedy Thai gets to sleep in his favorite spot again, right on top of my feet." Alexis J. from Brooklyn, NY says: "Thanks so much for your help. Teddy’s anxiety levels have subsided greatly. Your formula [Calm & Happy] made our move a much easier transition for him. Teddy is doing well with everything now and there haven’t been any major setbacks."